Ombre hair has been a favorite look for many years, and celebrities have long used it as a way to add color and depth to their hair. Whether you visit the salon or do it yourself at home, you can get the Ombre look in just the colors you want. Ombre is a French word that means shading or shaded which perfectly describes how Ombre dyed hair transitions from one base color to the highlight color. Ombre hair often starts out as a darker shade towards the roots and works its way to the ends with increasing lightness. Blonde Ombre hair has been fashionable each time summer approaches, and with the fall season, we can expect to see brown Ombre hair appear more often. Ombre is a style of hair dye that penetrates the color all the way through to create a two-tone shaded effect that can be done with any two colors. Lucy Hale is a well-known celebrity that recently dyed her hair brown with hints of pink in a true Ombre fashion. While the pink was quite subtle, and the shading was very well executed, the star still got quite the visual effect from the hair color. Blac Chyna is an excellent example of another celebrity that opted for the Ombre style hair color but chose to start with platinum roots which faded to a blue mid-section and ended with black tips. The Ombre effect was not only prominent thanks to the blue coloring, but her natural black tips contrasted beautifully with the rest of the colored shading. When you visit your salon, bring plenty of example photos so that your stylist is precise on the Ombre effect that you desire and you can discuss how it will work with your hair. Like with many hair coloring techniques, quite a bit of variation is possible, and colors should be matched to create a gentle transition across your locks. 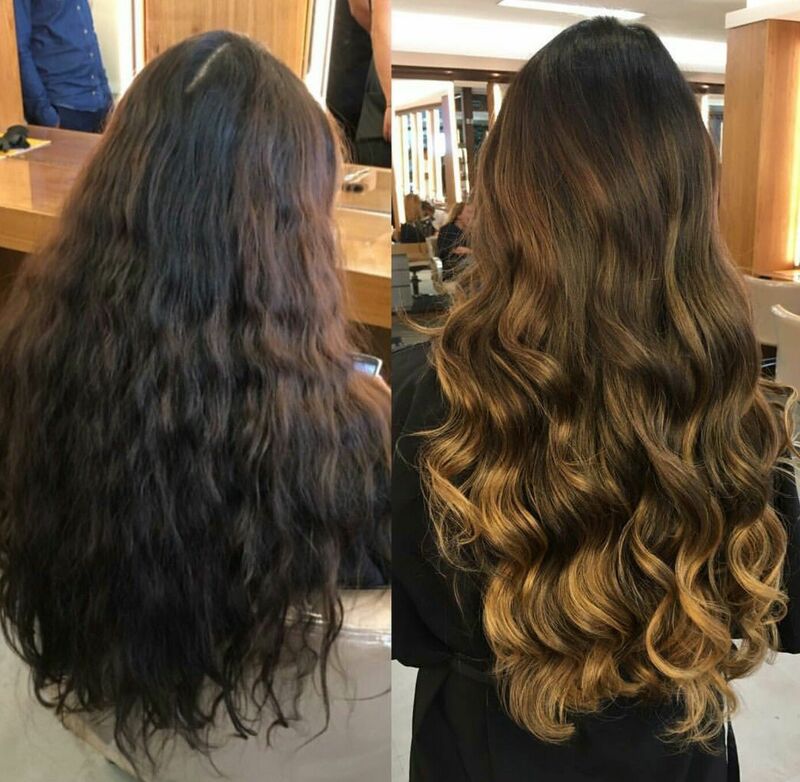 The Ombre technique can work with a variety of different hair types from long to short, and from straight to curly. If your hair is very short, this look may not be for you as it will be challenging to get the effect on such short strands. Those with wavy hair may appreciate this technique most of all as it will not only highlight their waves but will make their hair appear longer and sleeker. Those with curly hair can also get the same effects from the Ombre hair coloring, as it can add subtle volume reduction to, particularly unruly curls. Brown Ombre hair has been quite popular and even short Ombre hair in a brown shade has become a standard on the red carpet. The celebrity Jourdan Dunn is an excellent example of how Ombre hair can look great on a slightly curly pixie cut. Those with pin straight hair can still use the Ombre hair coloring technique although they may appreciate the effect more after styling. For fine hair, the Ombre effect can help to add volume, but styling it to have a slight wave will also add depth. Textured hair is probably the most likely to achieve a beachy style that is most popular with the Ombre hair color. 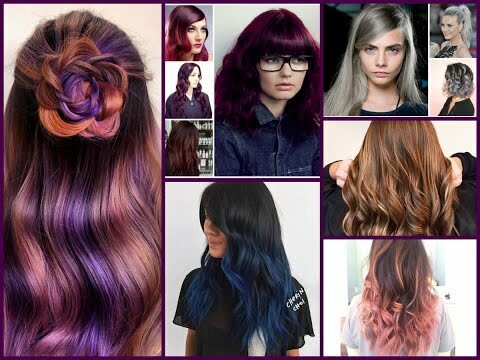 Whether you choose a radical or more traditional shade, Ombre looks the best when it’s in a slightly messy style. How Does Ombre Hair Dye Work? Ombre as a hairstyle works well because you already have roots, so when you decide to get your hair color touched up is entirely up to you. There’s no pressure due to the amount of regrowth, and your tips will continue to look beautiful as they grow outward. When you decide to get your haircut, you may also need to get your color touched up if the tips of the Ombre are too short. With regular trimmings, you could go months without needing to re-color, and when you do decide to color again, you may need to get the bottom half re-dyed. Several years ago, when Ombre made its appearance, it was quickly confused with dip-dying as celebrities had very dark roots and bleach blonde tips. 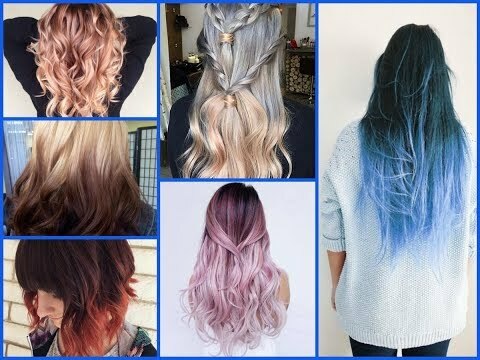 While many are relieved that the dip dying technique promptly moved away from the dark and light color scheme, many individuals were hesitant to try Ombre. 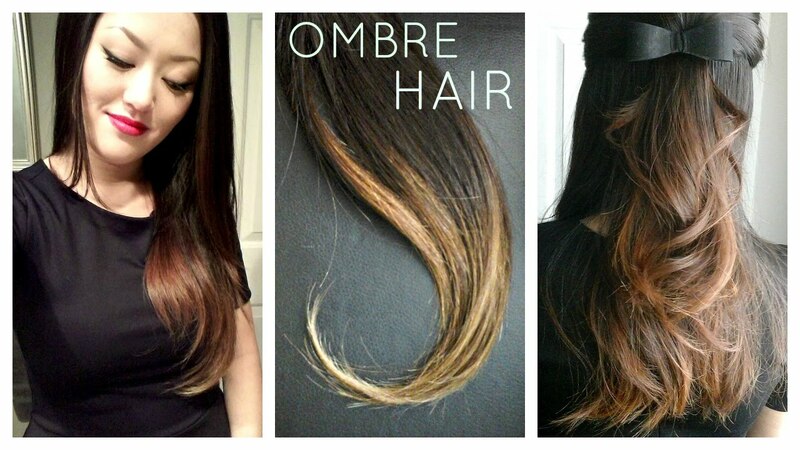 Ombre often uses more than two colors when dying, and this is what sets it apart from dip dying. Fortunately, the use of foil for some Ombre dye jobs means that the colors will stay bright and fresh. The downside is that Ombre can take longer to have done, and the coloring process can take a few hours. Bleaching parts of the hair are usually necessary, and overall highlights help the look appear more natural. This means that while your initial visit to the salon might take a couple of hours, in the long run, you can spend less time in the chair if your natural color is the one closest to the roots. For those looking to cover up grey hair, this technique may require more maintenance to best hide regrowth. Ombre kits have also emerged as the coloring has become more popular and this means that you may be able to do a simple Ombre look yourself at home. While this process may take practice, and you should plan on keeping things simple, the materials needed are common. If your hair is naturally dark, you may want to lighten it as you move towards the ends. Likewise, if your hair is a shade of brown or blonde you may want to darken or lighten the tips according to your taste. Ombre also works with every color in the rainbow so don’t be afraid to try a shade of hair dye that you’ve been eyeing. Blues, blondes, pinks, and red Ombre hair are all favorite colors to experiment with, and many of them are available as part of a kit you can use at home. 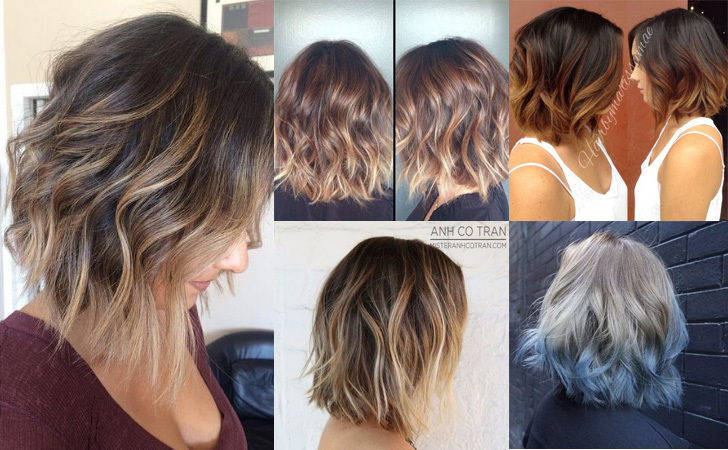 What Color of Ombre Hair Dying Is Available? 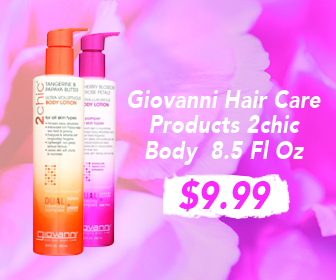 Several big-name brands offer Ombre hair kits including Revlon, L’Oréal Paris, and John Frieda. There are numerous tutorials available online that will help guide you through the process of dying your hair with different brands of hair color, and these can offer helpful tips. Before using a hair coloring kit, make sure to read through all of the instructions to make sure you are prepared to complete the process and have everything on hand that you will need. The last thing you’ll want to do is start the Ombre color process only to find out that you lack a key tool. Ombre hair color kits range from $8-$15 or more depending on the brand, amount of dye, and what else is in the package. Coloring kits may have liquid dye, foam dye, or you may need to mix a cream dye before applying it to your hair. If you are looking to mask some greys, consider using at least one shade of grey in your Ombre color scheme to make the greys appear like natural highlights. While it is in style to dye your dark hair grey in an Ombre type fashion, it can also mean increasing the overall amount of grey hair that you have. If you are happy with your current natural hair color, then supplementing with one other color may be all that you need. In that case, your options for hair coloring kits are somewhat unlimited, and given the number of tutorials online you can find directions on how to do an Ombre dye job using just about any hair color. Can I Dye My Hair Ombre Myself? If you feel up to DIY Ombre, then a simple internet search should yield many different suggestions for how to get started. Many videos walk you through the process step by step, and L’Oréal Paris offers a hair color kit for $13 that comes in 5 different shades. With a little practice you should be able to master the freestyle technique that is Ombre hair coloring, and where you decide to put the color is up to you. You can choose to frame your face, place many highlights, or use the color to distract from specific features. The beauty of Ombre hair coloring is that it can be easy to achieve an overall shaded look, and that makes it ideal for those who want to dye their hair, but don’t want to pay salon prices. A bonus to doing it yourself is that you can customize your look for far less money and time than going to the salon. By working in sections you’ll be able to create the same layers that you’d get at the salon, and the kits provide an expert application brush that you can use to brush the dye through your hair for a thorough application or a wispy touch. This ability to spread the dye so precisely allows you to move through the process quickly, while still getting impressive results. You can also use touch up kits for your roots if needed to extend the life of your DIY Ombre dye job.